2012 is quickly approaching. That means we’ll get our first glimpse into the new Fantasyland expansion inside the Magic Kingdom at Walt Disney World. If you’ve visited the Magic Kingdom recently you certainly noticed the walls and construction equipment located in the back half of Fantasyland. 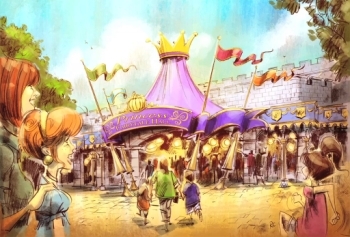 Fantasyland will double in size when its expansion is complete in 2013. Until then it will open in phases starting in 2012. Although Disney has not announced any specific dates for attraction or section openings we have a general idea of what to expect. With any new expansion or attractions at Disney’s theme parks I’m always very excited to see and discuss what’s in store for us. This is going to be “Ginormous”! Take a look at what we know so far and possible rumors for the Fantasyland expansion by continuing through the page break. For a general idea of what the expanded Fantasyland will look like check out this digitally created model and video by Walt Disney Imagineering. The Dumbo attraction will be relocated to the Storybook section of Fantasyland. 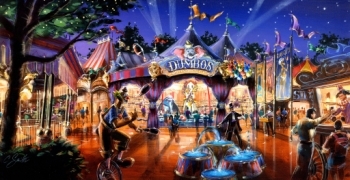 The existing Dumbo attraction will close around January 9th, 2012 to move to its new location with a circus theme. A new Dumbo ride carriage will be added allowing for twice the guest capacity. The queue area will be considered a holding area where guests can enjoy interactive experiences before boarding the ride without waiting in line the entire time. Some rumors have pointed to guests receiving a boarding pass upon entering the holding area (also known as the big top). When it’s your turn your boarding pass number(s) will be announced. The newly relocated Dumbo attraction will be one of the first attractions to open in early 2012 (possibly as early as late February or early March). 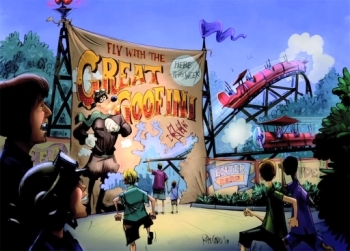 The ex-Goofy’s Barnstormer roller coaster will be rethemed into the ‘Great Goofini’. This magically rethemed attraction featuring Goofy the Magician will reopen in early 2012. 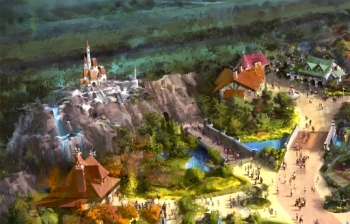 Also opening in early 2012 will be the newly rebuilt Fantasyland train station. Guests will be able to pick-up the train and make stops at the newly created Storybook section of Fantasyland. Next to the train station will be the ‘Casey Jr. Roundhouse’, a circus-themed, interactive water play area. This attraction will open with Dumbo and the Great Goofini in early 2012. A major new attraction, Under the Sea – Journey of the Little Mermaid will take guests through Ariel and her friends’ world. Climb aboard a clamshell as you make your way through this attraction with background music from the classic film. This attraction is scheduled to open no later than early 2013. Near the new Little Mermaid attraction will be ‘Scuttle’s Scavenger Hunt’. This fun, interactive game will allow guests to find treasures from the human world. 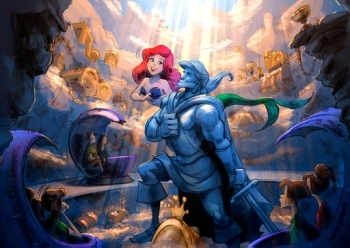 No date range has been announced for this attraction, but it will probably open around the same time as the Under the Sea – Little Mermaid attraction. ‘Castle of the Beast’ or Beast’s Castle will be visible from most of Fantasyland. Inside this castle will be a new dining outlet called ‘Be our Guest Restaurant’. The restaurant will feature an elegant ballroom setting with fast food counter service by day and full table service by night. 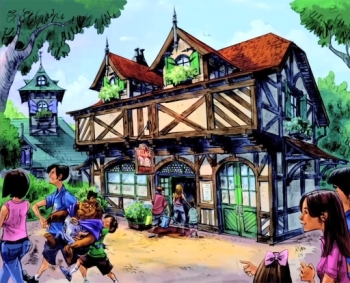 Just outside Beast’s Castle will be Gaston’s Tavern (non-alcoholic) and Bonjour! Village Gifts (a souvenir shop). 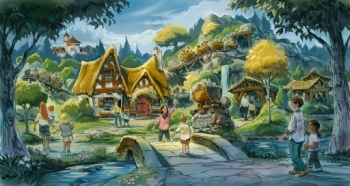 Nearby will be Belle’s Cottage where guests can enjoy a new kind of storytelling experience called ‘Enchanted Tales with Belle’. 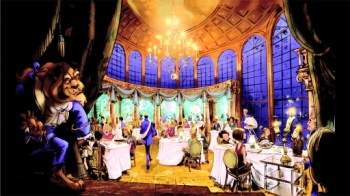 A magical mirror awaits and guests are transported to Beast’s Library where Belle and Lumiere await. These attractions are scheduled to open no later than early 2013. The Princess Fairytale Hall will be the place to meet and greet other Disney princesses like Aurora, Cinderella, and Tiana. No date has been announced for when this meet and greet will open. Another brand new attraction coming to the Fantasyland Expansion is the ‘Seven Dwarfs Mine Train’ coaster. Guests will move in and out of this attraction. The attraction will feature a first-of-its kind ride system that rocks the train side to side. Guests will enjoy animated figures of the Seven Dwarf characters mining for diamonds with background music from the classic film. This is scheduled to be the last attraction to open in the new Fantasyland expansion sometime in 2013. As with any major expansion at Walt Disney World these dates and attraction details can change based on construction delays, construction challenges, and Imagineering updates. Be sure to check the DIS for future updates as they are released by Disney Parks. Until then I can’t wait to see what’s in store for us in 2012 and 2013 in the new Fantasyland section of the Magic Kingdom; one of the biggest and boldest expansions in Disney World history. This is going to be HUGE! 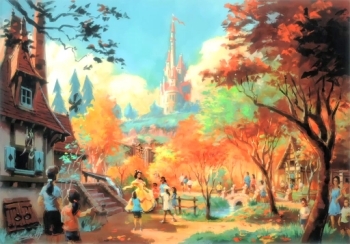 Concept art and concept video courtesy of the Walt Disney Company.